DHADING, March 8: Kedarnath Adhikari of Gajuri Rural Municipality-6 has already received Rs 50,000 from the government as the first tranche of relief for the reconstruction of his house. However, he has no plans to start the construction anytime soon. "The amount that I received as the first installment of the relief has already been spent and I have not even laid the foundation of my house yet," laments Kedarnath. After the catastrophic earthquake of 2015, Kedarnath has been living a miserable life in a makeshift tent. As the government has urged the service seekers to receive the second tranche of grant before mid-April, he is worried that he will have to lose the grant. During the earthquake, many houses were reduced to rubble while some were slightly damaged. Those victims whose houses were slightly damaged started living in the same houses by repairing them. The money that they received as the first tranche was mostly used for repairing their old houses. Some have built the foundation so that they won't have to return the amount given by the government. "I have heard that we will have to return the relief amount if we don't built our house," said Kedarnath, adding, "Now, I have no option other than laying the foundation by seeking loan." There are many quake victims who have not started the reconstruction despite being provided with the first installment. This ultimately has delayed the process for the distribution of the second and third tranches of relief. In Dhading, altogether 73,276 people were eligible for the grant and 68,840 among them have already signed the relief agreement. As per the details provided by the National Reconstruction Authority (NRA), 68,164 out of the total beneficiaries have been provided with the first tranche so far. Surprisingly, only few of them have laid the foundation of their houses. Reportedly, only 18,263 victims have taken the second tranche of grant which is possible only when the foundation of their house is constructed. In total, 31,666 houses are under construction in Dhading, according to NRA. Bir Bahadur Tamang of Gajuri Rural Municipality-1, Banskharka is currently waiting for the second tranche of grant after constructing the foundation of his house recently. "Though it had been a long time since I received my first installment of relief, I could not start the construction soon. 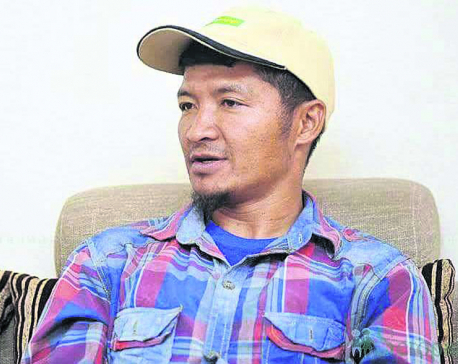 However, I did it recently and now I am waiting for the second installment," said Bir Bahadur. Sluggish reconstruction process in the district shows that all houses in the village won't be reconstructed within the deadline set by the government. Lack of manpower and construction materials have compounded the problem. As per the provision of the government, quake victims eligible for the relief will be provided with additional Rs 100,000 after the completion of their houses.